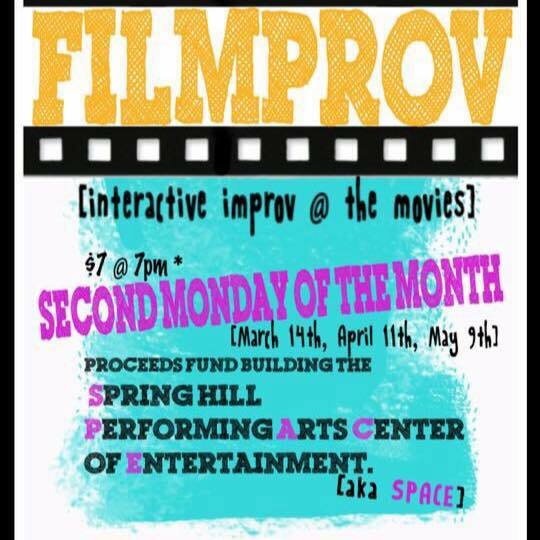 The May 9 performance of FILM PROV will be the last opportunity to see the live improv comedy show series, made possible by a partnership of the Spring Hill Arts Commission and the Carmike 12 Cinemas movie theater in The Crossings at Spring Hill. The show is a fun and entertaining way to raise money to build a SPACE (Spring Hill Performing Arts Center of Entertainment). This lively show is performed by an eight-member improv group, Film Prov; similar to ABC's improvisational comedy show, "Whose Line Is It Anyway?" Doors open at 6:30 p.m. with the show beginning at 7 p.m. Tickets are $7 per person. Contact Carmike for tickets at 931-674-0922.